Three Warwick Senior football players made their college decisions and have signed National Letters of Commitment for the fall of 2017. Senior QB Gene Decker will attend Western Connecticut State in Danbury, CT. Decker paced the Wildcat offense passing for over 1100 yards and 14 TDs as a senior. Nick Parchinski will attend Western New England University in Springfield, MA. Parchinski was a two year starter at linebacker, and played multiple offensive positions. He chose Western New England over Stone Hill College, Kutztown and Susquehanna University. 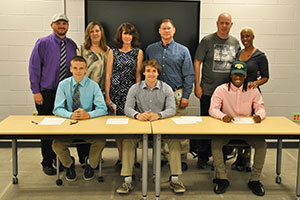 Warwick defensive back and wide receiver Tyler Williams will attend Hudson Valley in Troy, NY. Williams led the Wildcats with 3 punt/kick-off returns for TDs, and is one of Warwick’s most explosive players. 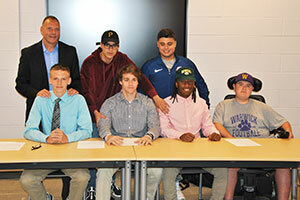 Congratulations, and best wishes to these WVHS athletes!